I’m a fan of the actual cooking shows though, just like an MTV fan back in the day was a fan of the music videos. I’m not really a fan of the contests, challenges, and travel bits. Last weekend, against the grain, I got sucked into “The Next Food Network Star”. It seems that they have some really great talent on the show this season. I instantly fell in love with Aarti, and this dish. Last week, I saw it on this blog here: The Enchanted Cook. I knew I had to try it because the Iron Chefs on the show RAVED about it, and it was appearing on blog posts everywhere! I’m happy to say that it turned out quite good! I think next time I’m going to try sautéing the fennel a bit before assembling the salad. It was a little too “in your face” for me, though it was quite refreshing! Preheat the oven to 375 degrees F. Line a baking sheet with parchment paper. In a mixing bowl, combine the turmeric, salt, and ground coriander. 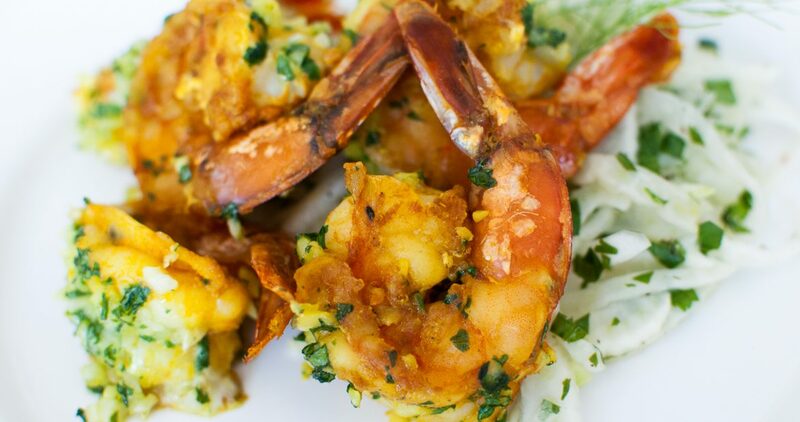 Toss the shrimp with the turmeric mixture and enough olive oil to coat. Mix the garlic with half of the cilantro and a 1/2 tablespoon of olive oil. Slice a deep slit in the back of each shrimp from head to just above the tail. Be sure to not cut all the way through the shrimp. Stuff each shrimp with the garlic mixture and line up on the prepared baking sheet. Roast in the oven until cooked through, about 10 to 15 minutes. Meanwhile, while the shrimp are cooking, toss the fennel with the lime juice and the remaining cilantro. Season the fennel salad with salt and a generous amount of pepper. Remove the shrimp from the oven. 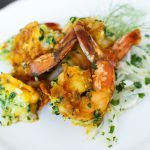 Serve 2 shrimp per plate with a small mound of fennel salad in the middle.